A group invited women to wear white to celebrate the women's suffrage movement. 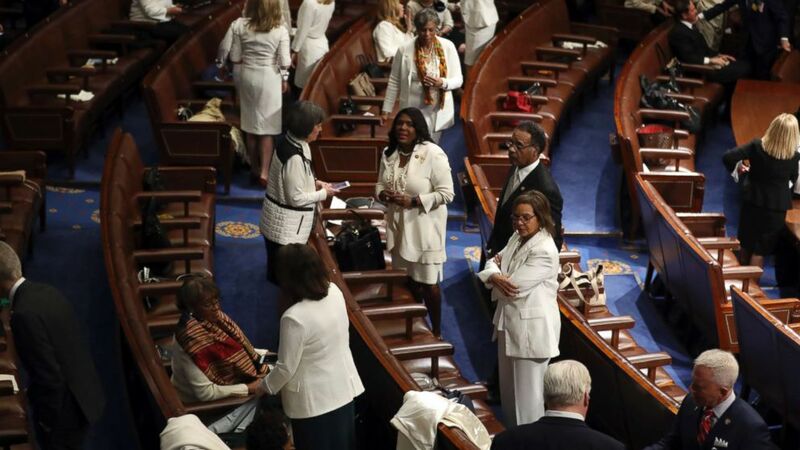 A congressional women's group encouraged lawmakers to wear white to President Donald Trump's State of the Union speech on Tuesday to show solidarity with the women's suffrage movement. 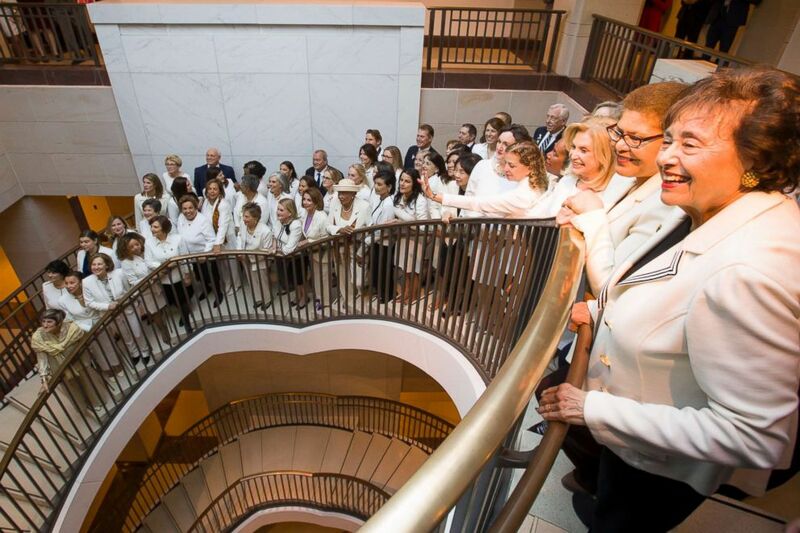 Rep. Lois Frankel, D-Fla., chair of the House Democratic Women's Working Group, tweeted an image at around 7 p.m. on Tuesday, showing members holding hands and dressed in all white ahead of the big event. "Standing hand in hand with @HouseDemWomen wearing #Suffragette white to #SOTU as we fight #ForThePeople," she tweeted. "At State of the Union tonight, @realDonaldTrump will look out at the House Chamber and see a sea of #Suffragette white sending the message loud&clear that @HouseDemWomen are fighting for the economic security of women & families," she added in a separate tweet. Frankel said she invited women to wear white in celebration of the women's suffrage movement. This year marks the 100th anniversary of Congress passing the 19th Amendment guaranteeing women the right to vote. The bold color choice was also a hat tip to the record number of women elected into Congress this year. There are more female lawmakers in the 116th Congress than ever before -- 102 female members of the House and 25 women in the Senate. "Nearly 100 years after women earned the right to vote, more than 100 women are serving in Congress," Rep. Val Demings, D-Fla., tweeted ahead of the address. "Tonight the @HouseDemWomen are wearing suffragette white to remind the president that we -- and the rights our ancestors fought for—aren't going anywhere." (Alex Brandon/AP) Rep. Nita Lowey is joined by other women wearing white as they pose for a group photo before the State of the Union address by President Donald Trump, on Capitol Hill, Feb. 5, 2019 in Washington. (Andrew Harnik/AP) Members of Congress gather on the floor before President Donald Trump delivers his State of the Union address to a joint session of Congress on Capitol Hill in Washington, Feb. 5, 2019. A few Democratic men, including Reps. Bobby Rush, D-Ga., and Steny Hoyer, D-Md., also got in on the action. Rush said he would wear all white in solidarity with his female colleagues and House Majority Leader Hoyer said he planned to hand out white lapel ribbons for other men to wear. "Proud to join House Democrats in wearing white or a white ribbon at the #SOTU to send a respectful message that we stand with women across the country and will continue to defend their rights," Hoyer said. "I thank @HouseDemWomen for leading this effort." "Honored tonight to be wearing a token of white along with @HouseDemWomen and in support of women’s representation, rights and freedoms," added Stacey Abrams, who delivered the Democratic response to the State of the Union. Rep. Alexandria Ocasio-Cortez, D-N.Y., wore an all-white suit to the inauguration ceremony for the 116th Congress. Hillary Clinton famously wore a white suit when she accepted the 2016 Democratic nomination for president. ABC News' Sarah Kolinovsky contributed to this report.